Welcome to October or should I say HELLO FROCKTOBER! Yes, once again I am very happy to be participating in Frocktober to help raise awareness and funds for Ovarian Cancer Research Foundation. This time I’ve started my own page which you can check out here. Just to recap, the challenge of Frocktober is to wear a dress every day, once a week or just once during October, document your efforts with the hashtag #Frocktober2015 and raise funds and awareness for the OCRF. “Ovarian cancer is an insidious disease, often known as a “silent-killer” as symptoms are vague and often strike without warning. Unlike many other cancers there is no early detection test. Consequently ovarian cancer is often diagnosed in its late stages and only 20%-30% of women will survive beyond five years of diagnosis. In comparison, survival rates increase to 80-100% when ovarian cancer is detected and treated early. Here on the blog, I’ll be wearing a fabulous frock every Friday from some of my favourite smaller, boutique and/or local designers. You’ll see what some fab new season frocks look like on me and be introduced to some less mainstream frockery. You might even find a new label or frock for you. 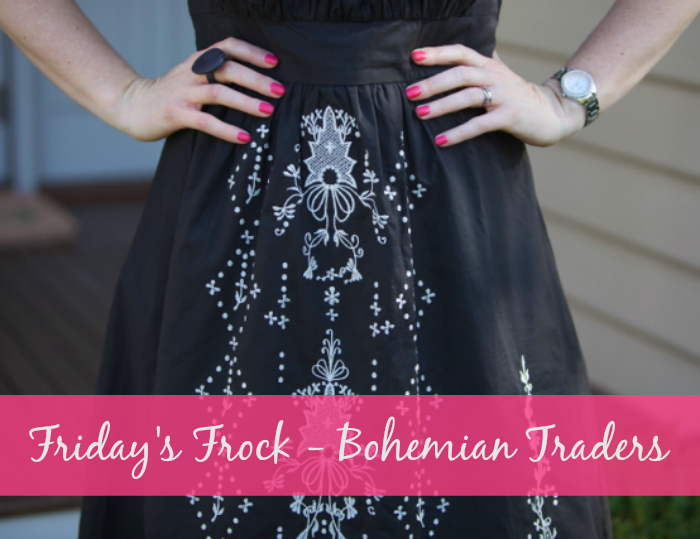 To begin with, I’m delighted to be kicking of Frocktober with this beautiful Folk Dress* from Bohemian Traders. If you’ve not been introduced, Bohemian Traders is a small, Australian label based in country NSW that my friend Emily began in 2014. 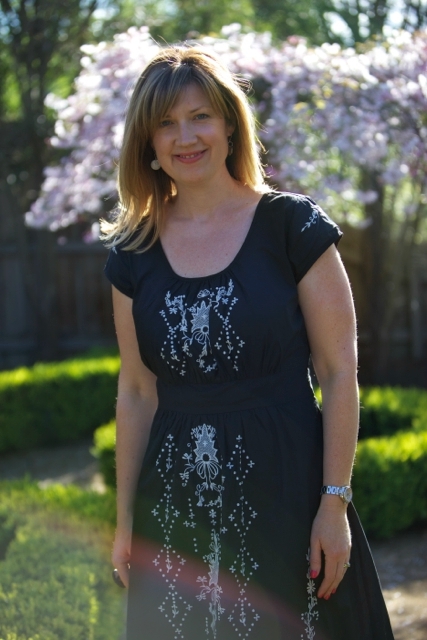 Bohemian Traders is all about “effortless threads for the modern bohemian”. You’ll find easy wearing basics in quality fabrics and beautiful statement pieces here, all with a point of difference. Below, I’m wearing the Folk Dress which is pictured above. This is such a beautiful boho inspired dress. 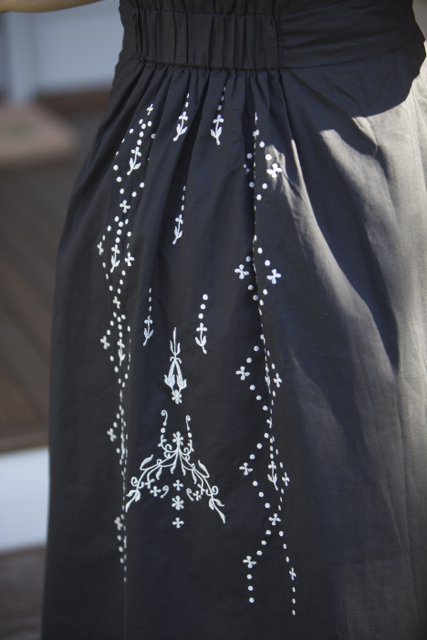 For me, the point of difference is the pretty folk embroidery on the front, sleeves and back of the dress. It creates some texture and looks particularly striking against the black of the dress. Made from quality cotton, this dress is double lined and is a step up from a casual every day dress. I’ll still be wearing mine by day though with sandals. For dressier do’s, I’d opt for espadrille wedges or clogs, as I’m wearing above (I’m wearing the T-bar clogs from Gorman’s AW15 range). Accessories wise, a pair of fine boho style earrings or a statement ring is all you need as the dress does most of the talking. In terms of the shape, with it’s fluted sleeves and A-line skirt, this is a forgiving, flattering shape, especially for pear or hourglass shaped gals like moi. I usually avoid a cap sleeve but the fluted sleeve is loose and doesn’t cut it on the arms. The skirt skims not clings and manages to fall flatteringly while the partly gathered waistband creates some shape, highlighting the waist. It sits firmly but not tightly on me and feels comfortable. It’s easy to put on too thanks to the invisible side zip. In terms of size, this dress is available in 7 sizes – XXS through to XXL. I’d say it’s on the neat side, as I’m wearing an L and it’s a perfect fit. (To give you a point of reference, I normally wear a 12 at Country Road and am a 12DD). 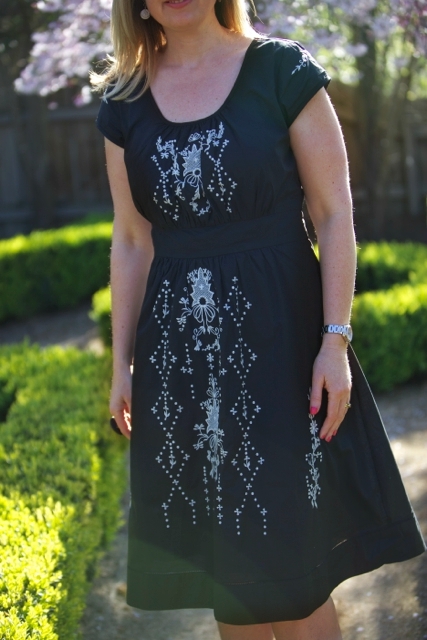 Length wise, it’s one of the longer dresses in the Bohemian Traders range, aside from the maxis. It hit’s me right on the knee and I’m 5’9″. I love this length and especially for taller girls, knee length is usually flattering. If you’re shorter, like the model above, the hem will hit you below the knee. Coming in at $179, this dress is an investment and one that you’d want to get some serious wear from to justify the price tag. At that price, I’m looking for a dress that is a bit different, interesting and one I can get some serious wear from. With end of year do’s, parent dinners, family gatherings and Christmas functions coming up, a dress like this is a great option. It’s easy to care for too – it’s 100% cotton and cold machine washable. 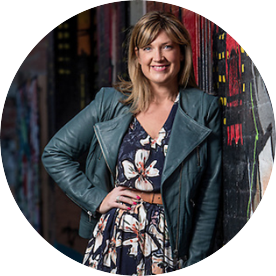 If you’d like to support me in my Frocktober-ing or find out more, just head here. * This dress was gifted to me in accordance with my Disclosure policy which you can check out here. 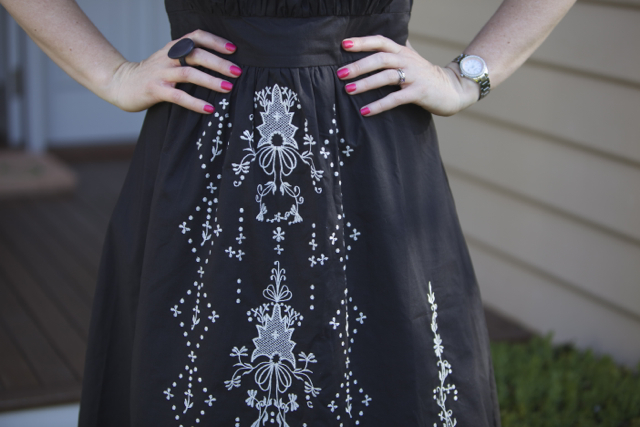 Are you a fan of Bohemian Traders and of this dress in particular? Are you participating in Frocktober this year?